College-bound students will find 37 accredited colleges and universities in Kansas, many of which are located in the wooded northeastern section of the state near Kansas City, as well as the south-central plains region near Wichita. Students will also find options for two-year programs at technical and community colleges located throughout Kansas, as well as approved private and out-of-state institutions offering approved programs of study in state. Choosing the right college includes considering factors such as program availability, tuition costs, extracurricular activities, and campus lifestyle. We help narrow the decision-making process by providing a list of the best two- and four-year colleges. Using a custom methodology, our algorithms analyze key performance benchmarks, drawing on federal education bases to pull data on acceptance, enrollment, retention and graduation rates. We also analyze student loan default percentages to provide a more holistic view of value for each institution. We have applied our rigorous methodology to the latest education data to rank the best colleges in Kansas, including the top four-year and two-year schools. Prospective students will find a wide range of degrees and programs to choose from at 37 accredited Kansas colleges and universities, 9 of which are public institutions. Though in-state tuition for full-time, 4-year public universities has risen from 2010 to 2015 by an average of 30%, the number of undergraduate students attending full-time increased by 5.1% between 2009 and 2014, and part-time status decreased by 6% in the same time period. During that time, Kansas' Hispanic and Latino population saw the greatest influx in enrollment, with an increase of 64.9%. Kansas saw an overall increase of 9.2% in bachelor's degrees earned during that five-year span. Kansas strategically invests in its universities to promote a highly-skilled workforce and robust economy, particularly in high-demand STEM fields. According to the Kansas Department of Commerce, Kansas recently invested $100 million in its colleges of engineering at Kansas State University, University of Kansas, and Wichita State University. The state legislature also granted $130 million for four major research facilities at Kansas Universities in the areas of food safety and research, biomedical, and aviation engineering. Source: Kansas Department of Commerce. Kansas State University (K-State) prides itself on its longstanding commitment to academic excellence, a world-renowned faculty, and a diversity of programs offerings. K-State offers on-campus programs at its 556-acre Manhattan campus, Polytechnic Campus, Salina Campus, and Olathe campus, including more than 250 undergraduate majors and numerous advanced degree programs. To ensure educational opportunities are accessible for the student body, Kansas State University provides more than $230 million in scholarships, grants, loans and work study programs annually. The student body at Kansas State is diverse, representing all 50 states and more than 100 countries. To keep students engaged and excited about learning, there are over 475 student organizations. Military families are also a priority at K-State, and as a result, Kansas State is home to the state's most sizable military population when compared to other colleges in Kansas. For active duty service members, K-State is conveniently located only 15 miles from Fort Riley, and offers outreach programs at Fort Riley and Fort Leavenworth. University of Kansas (KU) is all about research, and boasts a consistent record of producing independent, multidisciplinary research at its many research institutes, such as the University of Kansas Cancer Center, a unique institution among colleges in Kansas. Beyond its research initiatives, KU serves more than 28,000 students on its five campuses--including locations in Lawrence, Kansas City, Overland Park, Wichita, and Salina--and through its 13 schools offering more than 370 degree programs. For students pursuing a bachelor's degree, choice is the name of the game. KU offers 190 undergraduate majors in disciplines including the sciences, arts, and humanities, all of which are designed to provide students with the skills and knowledge needed to excel in the professional and academic worlds. In addition, the KU has several options for students seeking professional education, including programs in medicine, nursing, pharmacy, law, social welfare, and more. For degree students that need a little extra help, KU also offers a range of student services, including through the Writing Center and the University Career Center. Offering programs through six colleges, MidAmerica Nazarene University (MNU) provides a range of prodigious academic programs rooted in a Christian perspective, including more than 35 programs for undergraduate students, 4 bachelor's degree-completion programs, and several graduate degrees and certificate programs. Undergraduate degree programs span several disciplines, including accounting, biology, and history, as well as several unique programs, such as intercultural studies and kinesiology--a unique program among Kansas colleges. To ensure students can access these robust educational opportunities across the state, MNU has locations in Olathe, Kansas, as well as Liberty, Missouri. Beyond academic opportunities, MNU gives students access to a range of enriching groups, clubs, and supportive services. For instance, MNU has five women's residence halls and four men's residence halls for those that want to reside on campus, as well as varsity sports teams in the Heart of America Athletic Conference (HAAC), and an Academic Success Center to help students find professional success once graduated from MNU. Baker University consistently stands out as one of the top private colleges in Kansas because of its excellent academic record, small class sizes, and a community built on diversity and critical thinking. Students at Baker can enroll in academic programs in one of four schools: the College of Arts and Sciences, School of Nursing, School of Professional and Graduate Studies, and School of Education. For the globally-minded, Baker also offers study abroad and service learning opportunities. Students can choose among myriad bachelor's degree programs at Baker, including disciplines such as accounting, economics, and business, as well as the sciences, such as health and pre-medicine. With graduates boasting an 87% medical school acceptance rate, Baker is an ideal choice for students enrolling in a bachelor's degree program that dream of a career in the medical sciences. And for those interested in a career in medicine, but not medical school, Baker also offers a bachelor of science in nursing program. Manhattan Christian College is located in Manhattan, Kansas, and remains strongly committed to educating students that want to provide leadership and service in the name of Christ. To ensure education is accessible as possible, Manhattan Christian offers traditional, on-campus degree programs, adult education--including the Leadership Education for Adult Development (LEAD) degree completion program--as well as online-only classes. And beyond the educational programs, students also have plenty of opportunities to get involved with campus activities and pursue leadership opportunities by working as resident assistants, speaking at the weekly chapel services, engaging with the student council, and more. Students hoping to earn a bachelor's degree at one of the best colleges in Kansas should consider Manhattan Christian College, since offerings include both single and dual-degree programs. Students can also pursue programs that are unique among Kansas colleges, such as bachelor of arts or science degrees in in Christian ministry, including tracks in pastoral ministry, intercultural ministry, children’s ministry, family ministry, and more. With a new architecture program, a new Student Recreation Center, chemical, civil, electrical, and mechanical engineerig, a new science and engineering building and a leading undergraduate theology program, Benedictine College is truly becoming one of the top Catholic colleges in the nation. Founded in 1858, the school is a Catholic, Benedictine, residential, liberal arts college located on the bluffs above the Missouri River in Atchison, Kansas. Benedictine College has been named one of America's Best Colleges by U.S. News & World Report and one of the top Catholic colleges in the nation by the Newman Guide to Choosing a Catholic College. The school is proud to be the alma mater of the late Wangari Maathai, 2004 Nobel Peace Prize winner. Pittsburg State University (PSU) is the perfect choice for undergraduate students that want a rich academic experience on a diverse campus. PSU offers over 150 academic programs to more than 7,000 students from all over the world. And with a student-to-faculty ratio of 19:1--and an average undergraduate class size of no more than 20 students--PSU ensures all students get the individual attention needed to thrive in an institution of higher learning. For students seeking a bachelor's degree, PSU offers dozens of degree choices in degree programs focusing on applied job skills--like collision repair and insurance, automotive power mechanics, and construction management--as well as more traditional academic programs in the arts and sciences, including degrees in English and mathematics. In addition, the Honors College at PSU is a standout among Kansas Colleges. The Honors College is open to incoming freshman students, and offers many unique opportunities, including an overnight orientation, a pre-enrollment information session, and team building activities. Community and support are cornerstones of the educational experience at Hesston College--a college of the Mennonite Church that is one of the best colleges in Kansas. Hesston is committed to providing outstanding academic preparation while also living out the faith on which it was established and providing plenty of opportunities for fun and involvement. Hesston offers something for every interest. From intercollegiate and intramural sports, non-credit performing arts involvements and a variety of clubs, including the Knitting/Crochet Club and Cycling Club, for fans of physical activity, and the Stewardship Club, which encourages sustainability on campus. There are also a variety of activities offered through Campus Ministries, including Campus Worship, Bible studies and book study groups, as well as spiritual life retreats. The two-year general studies curriculum is central to the academic experience at Hesston, as all students begin with the same academic and professional preparation, ensuring a baseline education before specializing in a given major. Niche programs like aviation, air traffic control and disaster management offer more unique study and career opportunities. For undergraduates--who benefit from small class sizes and a nine-to-one student teacher ratio--there are many programs designed for transfer students, as well as a four-year bachelor's degree in nursing program that can be completed completely at Hesston. Located in Wichita, Kansas, Newman University provides students an accessible education even from across the state, offering classes at outreach sites in Southeast Kansas, Western Kansas, and even Colorado Springs, Colorado. As a Catholic university named for John Henry Cardinal Newman, Newman is committed to educating students holistically, and offers a robust, liberal arts curriculum. Newman University is perhaps the best choice for undecided students when compared to even the best colleges in Kansas. Students at Newman can declare an exploratory major, which means that students can take prerequisite courses while discovering more about their potential fields of interest, from biology to business. Newman also has several pre-professional bachelor's programs well-suited to students that want a head start on a fulfilling career. Pre-professional programs are offered in several fields, including dentistry, engineering, law, and even veterinary science. And all students have access to financial aid, and a range of scholarship opportunities, including undergraduates and transfer students. With a placement rate of over 95%, Fort Hays State University (FHSU) graduates are highly sought after in the job market and among institutions of higher education; it's no wonder then why FHSU is widely considered a leader among Kansas colleges. Serving more than 13,000 students, including more than 4,500 on its 200-acre campus, FHSU offers students several bachelor's degree programs at five academic colleges. Conveniently located mid-way between Denver and Kansas City, Fort Hays offers bachelor's degree programs in everything from art and design to English to modern languages. And for students that are focused on future career opportunities, Fort Hays offers programs in applied business studies, as well as economics, finance, and accounting. Fort Hays is also committed to ensuring members of the military receive the educational opportunities they deserve, and to that end, helps students access military education benefits through the financial assistance office. As on of the best colleges in Kansas, Emporia State University has been delivering high quality academic programs for over 150 years. Since its founding in 1863, Emporia has grown into a bustling university with celebrated programs in business, library and information management, and liberal arts and sciences. And for students that can't always make it to the Emporia campus, Emporia State offers undergraduate and graduate coursework at Kansas City Kansas Community College and Butler Community College in El Dorado. For undergraduate students, there are several bachelor’s degree programs available at Emporia State, all of which are accredited by the Higher Learning Commission. Programs include traditional, undergraduate academic programs--including degrees such as physical education, nursing, and English--as well as pre-professional programs--in fields such as dentistry, law, and medicine. And for students that need a little financial help, Emporia State has dedicated $9 million for the Presidential Scholarship program, making an education potentially more affordable for those that qualify. Wichita State University is located in Wichita, Kansas--the state's largest city and cultural hub--meaning students benefit from not only a top notch education, but also access to a vibrant urban area. There are also plenty of opportunities for fun on campus. The Rhatigan Student Center is central to the Wichita State community, and is the perfect place to study, grab something to eat, or even get a haircut. And for students with children to look after, Wichita State University’s Child Development Center provides the highest quality, affordable childcare to the WSU community. For any students with children between the ages of 6 weeks to 6 years, this is a major benefit of an education at Wichita State. Students can also choose among many academic programs at Wichita State University from one of eight different colleges and schools, including the College of Education, the College of Engineering, and the College of Fine Arts. Bachelor's degree programs include several tracks, such as anthropology, chemistry, finance, mathematics, and more, making Wichita State one of the best colleges in Kansas. Founded in 1865, OU is a private college affiliated with the American Baptist Churches USA. The school’s main campus is in Ottawa, enrolling about 5,000 students annually in its online and on-campus programs. The school offers unique degrees, such as digital media marketing, music, sport studies, and exercise science. The music program offers concentrations in vocal performance and jazz studies. Graduate students can pursue programs in education or business, which includes educational technology and an MBA with four optional concentrations: accounting, finance, human resources, and marketing. As one of the top colleges in Kansas, OU has produced many successful alumni, including economist and governor of the Federal Reserve Board Wayne Angell, comedian and actor Robin Hughes Harris, DNA researcher Leonard Erickson, and zoologist Howard K. Gloyd. Sitting on a 160-acre campus in Topeka, Washburn is a public college that offers more than 200 bachelor's, master's, and doctoral programs to a student body of more than 7,500. Undergraduates choose from dozens of degree programs, including creative advertising, digital forensics, film and video, and mass media studies. The school offers graduate students an assortment of degree options, including clinical psychology, law studies, and healthcare education. Washburn's campus is home to more than 100 student organizations, and the college supports several NCAA Division II athletic programs, including football, basketball, soccer, and tennis. Unique among public schools in Kansas, Washburn offers a special interstate tuition waiver that allows residents of Colorado, Missouri, Nebraska, Oklahoma, and Texas to pay the lower, in-state tuition rate. Friends University sums up its educational offering with three words: faith, friends, and future. That's because at Friends, students develop intellectually and spiritually within a community that is committed to caring for one another, and on a campus where diversity and openness are core values. In addition to its community values, Friends University also provides a strong liberal arts education, including 60 areas of study. And with a student-to-teacher ratio of 14-to-1, classes are small, so students benefit from a personalized education that stands out among Kansas colleges. For undergraduate students, Friends University offers several Bachelor of Arts, Bachelor of Science, and Bachelor of Business Administration degrees. Course offerings are diverse, from computer information systems and accounting, to psychology, mathematics, and music. And for students that want a more enriching, faith-based experience, the campus ministry offers a range of activities and programs, including frequent chapel services, a summer ministry initiative, and spring break mission trips. Founded in 1923, the University of Saint Mary is one of the best Kansas colleges known for offering a personalized approach to education, strongly grounded in moral principles and the Catholic faith. The liberal arts curriculum at University of Saint Mary means that students get a well-rounded education, preparing them to take leadership roles, make effective decisions, and solve problems efficiently. Students can choose to take classes at the main campus--located in Leavenworth, Kansas--or can take classes in the evening at the Overland Park location. Faith and education go hand-in-hand at Sterling College, a Christ-centered, four-year institution of higher learning with a longstanding mission to develop creative and thoughtful leaders with a desire to serve God. Although historically Sterling was affiliated with the Presbyterian Church, currently several denominations are represented. For undergraduate students looking for bachelor's degree opportunities, Sterling offers a range of options that stand out among colleges in Kansas. Degree programs at Sterling include traditional academic subjects, including biology, communication and media arts, and English, as well as programs well-suited to students of faith, including Biblical studies and Christian ministries. Beyond these academic offerings, on-campus students can benefit from other educational opportunities at Sterling. For instance, because Sterling participates in the Council for Christian Colleges and Universities, students have several exciting study abroad opportunities in England, Russia, Latin America, Australia, and more. And for graduating students, Sterling offers access to an on-campus career counselor to help students find the perfect career path. Tabor College is committed to preparing students for lifelong learning and service, with a commitment to Christ and His kingdom. Considering academics, Tabor has 26 bachelor’s degree programs covering several different disciplines, from graphic design and studio art for the aesthetically-minded, to biblical and religious studies and Christian ministry for students who want to incorporate faith into their professional endeavors. And for aspiring teachers, Tabor College offers majors in educational studies, elementary education, and secondary education, giving those that want to be classroom leaders a head start to a rewarding career. Beyond academics, Tabor offers its nearly 800 students many activities to make campus life fun and exciting. Tabor hosts 18 varsity sports teams, drama events, chapel services, and more. To benefit from campus life, students can choose to live in the dorms, where residence options include men's and women's quads, dorms dedicated to sophomore students, and separate residence halls for upperclassmen, making it a great choice among comparable Kansas colleges. Bethel College-North Newton provides students with an education grounded in the liberal arts, reinforcing the critical thinking skills needed to succeed in life outside of college. As a close-knit campus, nearly 70% of students live in on-campus residences, which provides opportunities for students to study together, develop a strong sense of community, and take advantage of student clubs, organizations, varsity athletic teams, and intramural sports. In addition, Bethel is an ideal choice for music enthusiasts looking at colleges in Kansas, since students have many opportunities to be involved with music and performance, from choral and instrumental ensembles, to music lessons, to productions put on through the theater department. For undergraduate students, Bethel offers three bachelor's programs, including bachelor of arts (BA), bachelor of science (BS), and bachelor of science in nursing (BSN) degrees. In addition, Bethel offers a unique undecided major, in which students finish their lower-level general education requirements and a career exploration course, before deciding on a course of study, or designing an individualized major. Founded in 1885, Southwestern College is situated on 82 acres in Winfield, Kansas, and serves students from 25 states, and from 10 countries around the world. Students benefit from a curriculum (and co-curricular activities) designed to encourage student leadership. And since 100% of students at Southwestern receive financial aid--including $4.5 million in financial assistance Southwestern provides to its students--the education at Southwestern Is accessible to everyone, regardless of financial circumstances. Academic outcomes at Southwestern College make it stand out among the best colleges in Kansas, since students can choose from 41 degree programs at the main campus, including 16 professional studies undergraduate majors, 27 minors, and teacher certification in 13 areas. Undergraduate bachelor's degree programs include everything from the sciences, such as biology and chemistry, to the arts, including musical theatre and theatre arts, both of which are ideal for musicians and performers that want to benefit from a collaborative educational experience. KWU, a private Christian college associated with the United Methodist Church, serves around 700 students from its campus in Salina. This small school offers an intimate academic experience, with smaller than average class sizes and a student-to-faculty ratio of 14:1. KWU offers graduate and undergraduate degrees. Programs and concentrations include 3D printing and modeling, music theater, forensic computing, art therapy, and emergency management. The college maintains relationships with many local and global organizations. KWU students often gain hands-on experience at local businesses or through study abroad opportunities. Befitting its reputation as one of the top schools in Kansas, KWU has produced several prominent alumni, including art critic Thomas Craven; former Kansas governor Bill Graves; and Wes Jackson, biologist and founder of The Land Institute. Donnelly, based in Kansas City, is a Catholic-affiliated school. Founded by the Benedictine Sisters of Mount St. Scholastica in 1949, the school offered accessible, affordable education to immigrant and working-class students. This tradition of serving the underserved continues to this day, as 81% of students are first-generation college students. Donnelly is one of the only schools in Kansas that is federally designated as a Minority Serving Institution and a Hispanic Serving Institution. The school provides professionally-focused degrees at the associate and bachelor's level. Donnelly's associate degrees include a wide selection of arts, sciences, applied sciences, and nursing programs, while its bachelor's programs include information systems, organizational leadership, and urban elementary education. The school also maintains a satellite campus at the Lansing Correctional Facility to serve incarcerated students. Founded in 1887 by the Church of the Brethren, McPherson is a Christian liberal arts college based in central Kansas. The school serves all Christian faiths and enrolls around 700 students annually. McPherson maintains a student-to-faculty ratio of 13:1. The college offers undergraduate programs in more than 30 areas, including automotive restoration, digital media, environmental stewardship, and performing arts. Undergraduates can also pursue the school's student-designed major track, which allows candidates to create their own program by combining different academic disciplines. Examples of previously designed majors include bioethics and international studies, political science and public relations, and broadcast journalism and sports management. The college also offers several pre-professional programs, including law, pharmacy, and veterinary medicine. McPherson, one of the best schools in Kansas, has produced many successful graduates, including sports interviewer and commentator Jonathan Coachman, meteoriticist Harvey H. Nininger, and billionaire businessman Harry Stine. Located in Overland Park, Kansas, Cleveland University-Kansas City (CUKC) remains one of the oldest nonprofit chiropractic colleges in the nation, and one of the best among Kansas colleges. Perfect for students with an interest in developing careers as chiropractors or in the health sciences, CUKC offers hands-on-training in technology focused classrooms, making the degree programs both professionally relevant and engaging. To that end, CUKC offers a doctor of chiropractic degree, a MS in health education and promotion, a BS in human biology (with an accelerated option), an AA in biological sciences, and a workplace health promotion certificate. For those wanting to pursue careers in radiology, physical therapy, nursing or other areas of health care, CUKC offers accelerated pre-professional science courses that can be completed in eight weeks. Unique among other bachelor's degree programs in the state, the concurrent DC/BS program is specially designed to help students maximize the time they put into their education by earning two degrees at once. What that means is more education, with a lower price tag. And for those students looking for a little financial assistance, Cleveland University-Kansas City gives students access to both scholarships and loans with the help of on-campus financial aid specialists. For students that want a Christ-centered education, there are few better choices among Kansas colleges than Central Christian College of Kansas, a long-standing institution with a rich history dating back to its founding in 1884. Located in McPherson, Central Christian College is a private institution known for providing an exemplary education, with undergraduate majors in several traditional disciplines, including business, education, and psychology, among others. Students benefit from many on-campus academic enrichment opportunities and student services, including residence halls, where over 85% of students choose to live when earning degrees on campus. A unique offering for undergraduate students at Central Christian College of Kansas is the ministry & theology program, in which students can earn degrees in pastoral ministry, general ministry, youth ministry, and worship arts. The program is ideal for students that want to pursue a stronger personal relationship with God, and gain the practical experience needed to be a leader with a knowledge rooted in biblical study. The Kansas Department of Commerce reports that about 90% of Kansas adults have a high school diploma, ranking the state number 17 in the country. Over 30% of Kansas adults 25 and older have a college degree. Despite high education rates, over 700,000 Kansas adults between the ages of 25 and 65 lack postsecondary credentials. Kansas has a long-term strategic plan to better prepare its workforce, with aims to achieve a 60% increase in the number of earned certificate, associate or bachelor's degree by 2020. Since implementing the plan, Kansas has seen an increase of 5.6% in associate degrees earned between 2009 and 2014. Kansas offers associate's degrees and certification programs at 43 two-year and training institutions throughout the state. In addition to more traditional two-year programs, Kansas has worked to find innovative ways to close this gap through its Accelerating Opportunity (AO-K) initiative. AO-K is a unique delivery system for adult education that allows students to earn short-term certifications through a career pathways framework. Salina Area Technical College (SATC) is one of the best community colleges in Kansas. It is committed to educating emerging generations of learners with technical skills, while also meeting the employment needs of the region. To this end, students can access a range of associate degree and certificate programs. Subjects range from the technical--including welding technology, machine tool technology, and commercial truck driving--to more general subjects, like graphic design and allied health. Students at SATC can also access many resources. For instance, for students that want housing, Salina Tech has partnered with Kansas State, so Salina Tech Students can be housed in Kansas State residence halls. SATC offers students a range of federal, state, and private financial aid programs, and in addition, military veterans can receive assistance accessing Veteran Affairs (VA) benefits through the Student Services office. And to keep these educational opportunities sustainable, the Salina Area Technical College Education Foundation encourages private support, raises funds, and initiates capital campaigns to augment the SATC operational budget. With a history dating back to 1921, Coffeyville Community College is one of the leading community colleges in Kansas, and as a comprehensive community college, serves over 2,000 students in Southeast Kansas. Coffeyville Community College provides students access to 19 academic programs, as well as 15 technical programs and more than ten certificate programs. With three campuses to choose from--including the main campus in downtown Coffeyville, as well as the Coffeyville Technical Campus and the Columbus Technical Campus--access to education is a top priority. Students at Coffeyville can earn an associate in arts degree in a wide range of disciplines, from digital communications and foreign language to political science and theatre. And since full time faculty teach over 90% of classes, students are guaranteed to receive the best possible classroom experience. To make sure all students can attend college, Coffeyville provides access to many activity and athletic scholarships, financial aid programs, and even has residence halls--Powell Hall and Walker Hall--so students can live on campus. Educators at Colby Community College are committed to providing students with opportunity by offering many educational choices, various degree options--such as associate degree and certificate programs--and the support needed to move on to a four-year institution. And for students that want to earn a terminal degree at Colby, there are many programs to choose from that prepare students for in-demand jobs. To earn an associate of arts degree, all Colby students must complete standard degree requirements, including classes in written communication, natural sciences and mathematics, and arts and humanities. After completing these basic courses, students can choose to major in a range of subjects, including history, social work, and English. Students may also choose to earn an associate of science or associate of applied science degree. In addition, a unique offering at Colby not frequently available at two-year colleges in Kansas are the Life Experience Credits, which are granted based relevant experience--like work or professional development. For students looking at two-year colleges in Kansas, Garden City Community College is an excellent choice, since high quality classes are offered to both in-state and out-of-state students, and for those that want to study over the internet. Many students are eligible to receive financial aid or scholarships, including those sponsored by local community organizations, or those delivered by the state, like State of Kansas Scholarship Programs. Associate degree students have a range of degree opportunities at Garden City Community College, including the lauded 2-year associate nursing degree. And students looking to become civically-engaged can study subjects including fire science or criminal justice, and for those that want to develop technical skills, Garden City hosts the John Deere tech program, as well as a welding technologies program. To ensure the success of students in these programs, the department of counseling and advising provides help to students when deciding which classes to take, and even mental health counseling if students need help overcoming stress, depression, or anxiety. Although Butler Community College is second largest community college in the state, it is leading the way in student experience among two-year colleges in Kansas. Butler serves students from around the world and across the state, and offers classes to more than 13,000 students annually. And for first year students, the First Year Experience (FYE) provides essential support, offers students access to several programs perfect for first-year students, and even hosts a student orientation--Student Connect. Academic offerings are delivered through Butler's discipline-specific divisions, including academic support, math, science, and education, career & technical education, fine arts & communication, humanities & social sciences, health, early childhood & public safety, and early college academies. Because paying for college in any academic track can be a challenge--even at an affordable institution like Butler Community College--financial aid counselors are available to help students receive federal education funding, like grants and direct loans, depending on financial need. Students that need a great reason to attend Hutchinson Community College are in luck, because there are many reasons: a beautiful campus, competitive athletics, a vast alumni network, affordability, and more. Of course, academics are also a standout, even when compared to similar Kansas community colleges. Majors at Hutchinson span a range of disciplines, from agriculture, business, and education, to nursing, public safety, and visual media design. For new students looking to earn an associate degree, Hutchinson offers on-campus housing through the Residence Life Office. Residences are spacious and comfortable, and even offer the opportunity for on-campus employment: students have the chance to serve as Resident Assistant (RAs) in the dormitories. In addition to on-campus housing, Hutchinson offers countless activities and supportive services through the Student Success Center, where staff assist students with academic supports, and life skill development. For students looking for an affordable, small-campus college experience, with ample personal attention, Independence Community College stands out as one of the top community colleges in Kansas. With a storied history, including a rich athletics program, excellent fine arts courses, and more, Independence ensures that students receive a high-quality educational experience while preparing for job in a competitive economy. And since students can choose to pursue both residential and non-residential options, Independence caters to the needs of every student. Academic choice is paramount at Independence Community College, ranging from conventional academic tracks in the arts and sciences, all the way through vocational programs, like construction engineering technology, cosmetology, manufacturing skills training, and more. Through the Office of Financial Aid, students can access institutional and foundation scholarships, and Student Support Services (SSS) Grants. And for students that don't qualify for financial aid or federal work study programs, student labor is available to help offset educational costs. The academic experience is central to life at Cloud County Community College--a leader among Kansas community colleges--which offers students more than 30 different academic areas to pursue, including more than 300 courses each semester. For students taking classes at Cloud County, degrees offered include associate in arts, associate in science, associate in applied science, and associate in general studies degrees. For traditional students taking classes on-campus, residence life at Cloud County Community College makes the campus experience complete, since it puts students at the center of a vibrant campus experience, with access to labs, the library, athletic facilities, teacher offices, and more. Regardless of whether students live in the T-Bird Village, Hillside Apartments, or LaBarge Honors House, everything is just a stone's throw away. And since college life means more than just studying, students at Cloud County Community College benefit from participating in clubs and organizations, like the cheer squad, rodeo club, and student senate. North Central Kansas Technical College, located in Beloit, is a leader among technical, two-year colleges in Kansas, and offers students access to classes and degree programs in several courses of study--including business, construction, health, technology, transportation technology, general education, and more. Although some students enter confident about their academic interests, for students feeling unsure about how to move forward in a college setting, the Academic Advising and Career Exploration Center provides services that help students thrive academically, and determine the right career path. It goes without saying that every student benefits from academic programs, but to get the full college experience, North Central has dozens of extra-curricular activities to choose from, including sports like softball, flag football, and basketball, community service organizations, like food pantry and bloodmobile, and the student senate. North Central even has an online magazine, so both students and alumni can keep up with the institutional goings-on. Founded in 1936, Neosho County Community College (NCCC) offers over 1,400 classes in 19 different locations, making it easier than ever to earn a degree at one of the best community colleges in Kansas. Despite its geographic diversity, NCCC offers classes primarily at two locations: the residential campus in Chanute, and a campus serving Ottawa in north central Kansas. NCCC also offers classes online to 400 students annually. There are myriad programs for associate degree-seeking students to choose from at NCCC in disciplines including athletics, business, computers, education, English, and more. And for highly achieving students, the Neosho County Community College Honors Program provides a more challenging learning experience where students take select general education courses, are enriched with leadership skills, and participate with an engaging community of learners. Beyond academics, athletics are also prominent at NCCC, which hosts five men's sports teams and five women's sports teams, as well as a co-ed spirit squad. For students just starting an educational journey--or for those returning to school after a period away from higher education--Flint Hills Technical College (FHTC) is an excellent choice, even when compared to other community colleges in Kansas. FHTC is a two-year public higher education institution, nestled into the rolling hills of east-central Kansas. FHTC offers 19 programs of study specifically designed to match with industry needs, and all courses are delivered with a focus on making coursework relevant to the real world. Degree offerings at Flint Hills Technical College include 16 Associate of Applied Science degrees, 14 technical certificates, and additional licensure programs, all delivered in a personal classroom environment (because of the 15-to-1 student to faculty ratio). Associate degrees include everything from automotive technology and dental hygiene to interactive multimedia design. And beyond the classroom, Career Services is a one-stop shop for students at FHTC, and helps to prepare students for a wide range of career options, apply for continuing education, and search for jobs. This process includes creating an interest inventory, personality tests, resume writing, and more. What started as a college serving those that wanted to transfer to four-year institutions has evolved into a comprehensive comprehensive community college offering dozens of degrees and myriad programs to students across the four-state region. Students at Labette Community College can select among many degree programs, from biology, chemistry, and computer science to graphic design and history. And for students that need a little help choosing among the different degree programs, Labette students can access FOCUS 2, a self-paced, online career and education planning tool that can help any student make strategic, forward-thinking decisions. The campus offers unique resources to students, including the campus bookstore, library, and alumni office, as well as the Ed Hendershot Gallery--a modern exhibition space that serves as a location for activities that promote personal enrichment. Beyond extracurricular activities, the Student Affairs Office and Financial Aid Office help students succeed academically and ensure educational opportunities are affordable, making Labette a great choice among community colleges in Kansas. The areas of study at Johnson County Community College (JCCC)—one of the best community colleges in Kansas--are suited to vocational students and students that want to gain a strong academic foundation and transfer to a four-year college. To make sure geography doesn't get in the way of accessing high quality classes, JCCC offers a selection of credit and continuing education courses at locations in the Kansas City and Lawrence areas, including at regional high schools. It's no surprise then that JCCC serves more than 46,000 enrolled students each academic year. Johnson County Community College (JCCC) offers undergraduate credit courses and certificate programs, including associate degree-level academic courses, like humanities & social science, and math & science, as well as vocational tracks, like industrial technology, and hospitality & culinary. For students that want to take their JCCC learning to a baccalaureate college, students are supported throughout the transfer process, and JCCC provides helpful advising services and tips for students going through the process. A central institution to the community for more than 75 years, Pratt Community College is committed to providing students the educational opportunities they want, and delivering graduates that can help meet the professional needs of the community at large. Because Pratt offers a strong educational foundation, students can either complete a degree at Pratt, or continue on to a four-year baccalaureate institution. And with 52 academic and technical degree options to choose from, students looking at the best community colleges in Kansas will find what they need at Pratt. Pratt Community College offers both traditional education and general education programs. For the former, students can choose among mathematics and sciences, arts, communications, and education, performing arts, and more. Technical education students can choose among several programs, including a wildlife outfitting & operations program--the only one in the state (and one of only two in the nation). Graduates leave the program well prepared for jobs in the burgeoning commercial hunting and fishing industries. The education at Seward County Community College is dynamic and evolutionary, because educators at Seward believe higher education is an essential part of the civic experience, and an investment in each and every student's future. To ensure students receive the best possible education even when considering other Kansas community colleges, Seward offers 45 individual programs of study, including associate of arts, science, general studies, and applied sciences degrees, as well as several certificate programs. Students can study everything from English to mathematics, criminal justice to medicine. Each class is delivered by esteemed faculty, many of whom hold doctorate-level credentials, and all of whom provide students with lessons learned from real-world experience in a specific field of study. Seward County Community College is also affordable, since matriculated students are eligible to receive scholarships, grants, and loans, and can even work full-time while attending college. To further support students, Seward has a strong relationship with Inceptia--a division of National Student Loan Program--so every student can access federal loan opportunities and pay for college. For students that want to improve their relevance on the job market, Northwest Kansas Technical College is an ideal choice among two-year colleges in Kansas. Northwest offers more than a dozen programs, including vocational programs--like automotive technology, carpentry, and cosmetology--as well as professionally-relevant programs like medical assistant, network technology, and respiratory therapy. All programs are delivered with the assistance of the newest technologies, ensuring students get the best possible educational opportunities. For students that want to pursue degrees remotely, Northwest provides access to online learning with the help of a student information system--Empower--and a learning management system--Moodle. In addition, Northwest is an excellent choices for members of the armed services, because Northwest Tech is committed to assisting military and veteran students establish themselves in new, civilian careers. And to help students pay for educational opportunities, Northwest helps students access financial aid, like grants, scholarships, and loans, and also provides viable work-study opportunities. Located in Fort Scott, Kansas, Fort Scott Community College--one of the best community colleges in Kansas--gives students a comprehensive academic experience, including access to more than 40 different academic programs of study. The public, nonprofit institution helps students to pursue both certificate and associate degrees in subjects including science, mathematics, history, English, business, and computer science. And with locations in Fort Scott, Paola, Pittsburg, and Frontenac, students across the state can enroll in classes. But learning is about more than just academics at Fort Scott. Students can choose to participate in many student organizations—including band, Christians on campus, the collegiate farm bureau, and more. There are also athletic activities, such as baseball, softball, and basketball. Students can also opt into housing services, including Greyhound Hall and Boileau Hall. And for all students, the FSCC Cafeteria serves traditional food, as well as premium monthly specials, so there's something for everyone. Kansas City Kansas Community College (KCKCC) is centrally located within the Kansas City city limits, and because more than 6,000 students are enrolled, KCKCC also provides courses and degree programs at two extension sites--the Kansas City Kansas Community College-Leavenworth Pioneer Career Center, and the Dr. Thomas R. Burke Technical Education Center. This public, open-door community college offers dozens of associate degrees, technical certificates, and continuing education programs, meaning that any and all students can find an ideal area of study at KCKCC. Highly-achieving students may be eligible for scholarships and awards that come from a variety of sources, depending on grade point average, community service history, residency, and financial need. For instance, KCKCC offers four specific, merit-based scholarships: the Honor's Dean Scholarship, Honors GED Presidential Scholarship, Honors Presidential Scholarship, and Youth Enrichment Seminar Scholarship, among others. For students that need financial assistance but don't meet the stringent requirements of academic scholarships, KCKCC also provides access to federal Pell Grants, as well as student loans and work study programs, making it a top choice among two-year colleges in Kansas. Dodge City Community College (DCCC) offers more than just academic programs: students benefit from access to extracurricular activities and athletics. Activities include everything from jazz ensemble and pep band, to the student government association, to radio and television broadcasting--a unique offering among community colleges in Kansas. Students can commute to class, or choose to live on campus at one of four residence halls, including the men's hall (Shelden) or the women's hall (Coleman-Webb). When pursuing academics, students at DCCC are not alone, since academic advisors are available to help guide students through every step of the process, from choosing a field of study, to transferring to a four-year college. Students can earn associate degrees in four fields: arts, sciences, general studies, and applied studies. Unlike the other three degree offerings--which can be used for students that want to transfer--the applied studies degree is a terminal program that prepares students to enter the workforce, including topics such as agribusiness, computer science, graphic design, and welding technology. As a school committed to tradition, quality, and convenience, Allen Community College (ACCC) makes getting an education as easy as possible. With two campus locations--Burlingame and Iola--students can access classes easily, regardless of where they live or work. ACC caters to all kinds of students, from new college students to nontraditional students, and even offers high school students the chance to earn concurrent credits. All students benefit from the quality of ACC courses, which are delivered by a highly-regarded faculty of academic scholars, including both university-parallel courses and career-focused technical education. All courses are delivered with one goal in mind: student success. Students at ACC get more than just access to great courses, since there are also unique opportunities to engage with fellow students in non-academic activities. For writers, there are two unique opportunities that are not available at other community colleges in Kansas, including the Creative Writing Club, which is open to students that want to produce creative work, whether poetry, prose, or graphic novels, and the ACC newspaper, the Flame. Cowley County Community College (CCCC) wants to champion the relevance of two-year colleges by providing students with holistic learning opportunities and workforce development programs while adhering to four core values: people, accountability, integrity, and leadership. More than half of CCCC students are full-time and pursuing degree studies--in one of 80 major and degree tracks--in campus locations in Arkansas City, Mulvane, or Winfield. Students at CCCC can earn associate of arts, science, applied science, or general studies degrees across several academic departments. Degree options run the gamut of possibilities, from accounting and business administration, to biology, creative writing, and welding technology. And for students that want to earn a CCCC degree, but can't make it to campus, online classes are available, as are hybrid courses, which blend traditional in-classroom learning with distance education. This flexibility is well suited to students in the military looking for an education at community colleges in Kansas, because CCCC has dedicated Military Education Services Representatives to streamline the application and enrollment process. Serving nine counties in Northeast Kansas, Highland Community College gives students many choices when it comes to finding a degree track, since students can choose among Associate in Arts, Associate in Science, and Associate in Applied Science degrees. Associate degree programs are offered in a range of disciplines, including programs that are unique among community colleges in Kansas, such as criminal justice, personal fitness training, and viticulture. And with programs designed to help students pursue further studies at baccalaureate institutions, Highland is committed to ensuring the long-term success of those that walk through its doors. Students can choose to take classes either online or in-person, and for those that want a traditional on-campus experience, Highland Community College makes sure that learning doesn't stop at the classroom door. The Office of Student Life organizes many events and engaging activities, from fun runs to intramural sports. And for athletics enthusiasts, Highland has several men's and women's athletic programs including basketball, baseball, football, and track. 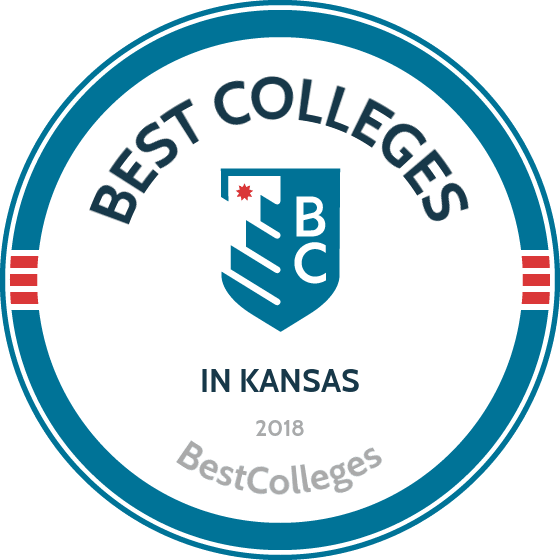 For students looking to enroll at one of the comprehensive, two-year colleges in Kansas, Barton Community College is a top choice, both for its excellent academics, and geographic accessibility--serving Rice, Rush, Ellsworth, Stafford, Pawnee, Ellis, and Barton Counties. Barton offers workforce training programs, career programs, and degree options, including associate in arts, associate in science, associate in general studies, and associate in applied science degrees. Because of this diversity in choice, regardless of a student's academic or career goals, everyone can get the foundational education they need to move on to a professional environment, or continue on at a four-year college. For on-campus students, the full-service Fort Riley campus has a bookstore, library, and financial aid office. In addition, there are many student clubs and organizations, including those focused on academics, worship, politics, sports, and more. And all students at Barton are represented by Student Government, which is comprised of elected officials, and representatives from student clubs. Located in Manhattan, Kansas, Manhattan Area Technical College (MATC) is a leader among Kansas community colleges in encouraging diversity in its student body, including more than just demographics. For instance, nontraditional students, distance learners, and even current high school students can access learning options at MATC; the latter can take college-level courses often at no cost to the student. MATC also has a plethora of options for active duty and retired military members, as well as military dependents. This includes help accessing financial support--through the Post 9/11 GI Bill, Tuition Assistance, or MyCAA--and ACE credits for earlier work and training. Program offerings at MATC are delivered in four divisions: health sciences, biotechnology, business, and transportation. Regardless of the specific program track chosen, all MATC programs can be completed in either one or two years, in small classroom settings, with instruction rooted in real-world, hands-on learning. And for students that want to continue pursuing academics--even after completing the credits needed for an associate degree--students can receive assistance transferring credits. Wichita Area Technical College (WATC) is one of the top two-year colleges in Kansas providing training for students that want high-wage, in-demand jobs. And because WATC works closely with regional employers to assess job needs, graduates leave ready for employment. WATC offers associate of applied science, certificate of completion, and technical certificate programs in subjects as diverse as aviation, manufacturing, and police science. Students can also choose to earn an associate degree with the help of WATC and Wichita State University (WSU), through the Shocker Pathway. This program allows students to earn a degree by completing general education requirements at WATC, and then by completing an additional 15 credit hours, students earn an associate degree from WSU. These degree and certificate programs (75 in total) are offered on three campuses: The National Center for Aviation Training (Main Campus), Southside Center, and Grove Campus. And to make sure military service members can access these specialized courses of study, WATC provides assistance to veterans so they can receive education funding through the Post-9/11 GI Bill, MGIB program, MGIB-SR program, Veterans Educational Assistance program, and more. If you're thinking about applying to one of the best colleges in Kansas, continuing reading to learn more about living in the Sunflower State. Kansas is known as the Sunflower State, and is known for its wide central prairies and limestone bluffs in the central Flint Hills region. Nature enthusiasts will find a diverse set of land features across the centrally-located state, from wooded hills in the northeast to canyons and mesas down south. Kansas ranks in the top one-third of states for clean air and is ranked 10th in percentage of sunshine. A blend of urban and rural communities, Kansas has a thriving economic industry base, particularly in the areas of bioscience and agriculture; logistics and distribution; energy technology; and advanced manufacturing in the aerospace and automotive industries. Residents of Kansas will find a strong athletic presence in its communities. In addition to being known as the Soccer Capital of America (Kansas City), the state is home to two of the top golf courses in the nation according to Golf Digest. The Kansas Speedway also hosts NASCAR races each year. Kansas also harbors a rich collection of historical attractions, including the Brown vs. Board site and the Eisenhower Presidential Library and Museum. Foodies can explore a slew of local fare and BBQ restaurants throughout Kansas, which is also known as the Breadbasket of America. Ease of travel is a highlight of living in Kansas, which was recognized in 2013 for some of the best road systems in the nation by the Reason Foundation. The average commute in Kansas is 18 minutes, the fourth shortest nationwide. The cost of living in Kansas is about 8.74% of the national average, ranking the state the 6th most cost-friendly state in the nation.